Minh Le is an unofficial spokesman for the Vietnamese community in Bayou La Batre, Alabama. Approximately one-third of the town's population is of Asian descent, and of those, most are Vietnamese. Adopted by an American serviceman during the 1960s, Minh returned to his native Vietnam in the ’70s to act as an advisor to the US Navy. When he retired from the Navy, he moved to Bayou La Batre and bought several shrimp boats, including The Sunrise, pictured here. 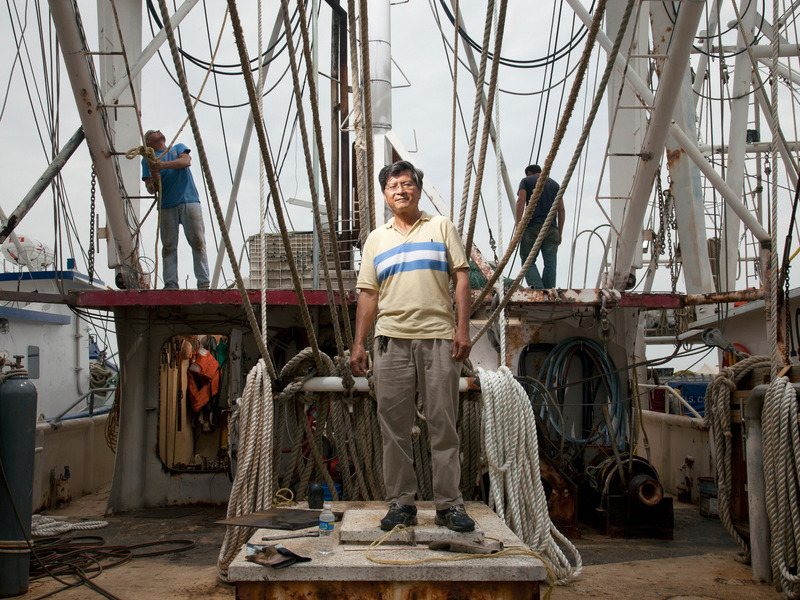 After the BP oil spill, Minh outfitted his boats to help with the cleanup efforts. Paul Nelson is the president of South Bay Community Alliance, a volunteer organization that advocates on behalf of the citizens of Bayou La Batre and Coden. Paul’s home was destroyed in Katrina, as was the home of his mother, who died in a trailer provided by FEMA. Paul has been traveling to and from Montgomery and Washington D.C. advocating for the people of South Mobile County since the spill. He’s currently pushing for the Gulf Coast Civics Work Act, a program devoted to putting unemployed Southerners to work on civic projects. Kyong “Kathy” Kim came to the United States from Korea in 1969. She attended college, then married a Colonel in the US Army and lived in Virginia until two and a half years ago, when she opened a crab shop in Bayou La Batre, Alabama. Her shop has been closed since the BP oil spill, and she has no plans to reopen it. She is moving to Mobile and collecting Social Security. All of her friends and family live in Virginia, but here, she says, “the price is right.” Kathy makes beaded sculptures that sometimes sell for as much as $350. She says she is especially attached to her dog Cutie because she has no friends down here. Alan Clark is an oysterman who worked for the BP Vessels of Opportunity program, which offers between $1,200 and $3,000 a day to local boat owners who help with the oil cleanup. Crewmembers make an additional $200 a day. Allen has been dissatisfied with BP’s hiring policies, which initially did not privilege fisherman who, like Allen, were unable to work after the spill. The average yearly household income in Bayou La Batre is under $25,000. Allen’s son’s first invoice was for $23,000. He came home with $17,000 cash in his pocket and took the day off to shop for a Hummer. Timmy Chi Tai is a nine-year-old from Bayou La Batre. He is one of four brothers. His mother came to America in the ‘70s with her Vietnamese mother and American father. After the oil spill, Timmy’s father was working for BP’s Vessels of Opportunity Program until he was deactivated. Timmy works at Boat People SOS, a local non-profit, handing out food during food drives and helping with various tasks around the office. Dale Williams is a shipbuilder in Bayou La Batre. Most of his customers, however, are based in New England. In July, Dale was offered a business proposition by a concrete worker who had figured out how to convert cement trucks into oil-water separators. Had they found investors, Dale would have outfitted boats to take the machines out into the Gulf. Ervin Royal is a metal scrapper from Coden, an unincorporated community that is contiguous with Bayou La Batre, Alabama. Most of his customers are commercial fishermen and his business has been suffering ever since the BP oil spill. Ervin (right) is pictured here with Ernest Montgomery (left), the former fire chief of Bayou La Batre. They’ve known each other for over 50 years. Mayor Stanley Wright was elected to office in 2000. Since then, Bayou La Batre has been decimated by three disasters – Hurricanes Ivan and Katrina, and the BP oil spill – forcing Stanley into the national spotlight. The mayor of Bayou La Batre is a part time position; Stanley worked primarily as a commercial fisherman until the Deepwater Horizon disaster, when he was forced to close his oyster processing plant. Mayor Wright prides himself on being a non-politician. He enjoys deer hunting and peach-flavored chewing tobacco. Darryl Wilson is captain of the Bayou La Batre Police Department. He’s been with the force for 19 years, and specializes in drug cases. He often dresses in civilian clothing and drives this confiscated SUV that he took from an Ecstasy dealer. He expects drug sales to skyrocket due to the infusion of BP compensation money. Ha Nu and her husband run Vien Dong, a Vietnamese market in the center of Bayou La Batre. They opened the market in 1986 after spending seven years in Los Angeles. Ha is originally from Vietnam, where her parents and nine siblings still live. She moved to the United States in 1978 and has only returned three times. Ha used to run a restaurant and billiard room, too, but they were destroyed during Hurricane Katrina, and the cost to reopen was too daunting. Ha has been trying to gain US citizenship since 1986. She is currently in the process of reapplying. Long known as the seafood capital of Alabama, Bayou La Batre is a small town of approximately 2,500. Over the past decade, foreign imports, the rising cost of diesel fuel, and overfishing have eroded the seafood industry that supports this community. After Hurricane Ivan and Hurricane Katrina, business slowed even further as residents of the area rebuilt from the ground up. The oyster reefs in Mobile Bay were destroyed and many shrimp boats were literally run aground as their owners were unable to make payments. The community was just beginning to recover when the Deepwater Horizon oil rig exploded in April. Now, in the aftermath, BP has thrown astonishing amounts of money at this small town, creating divisions in this diverse community. With the seafood industry at a standstill, competition for BP’s “free money” has caused an uglier side of the local identity to emerge, as the same stubbornness that community members take pride in has pit them against each other. Worse still, the influx of money and the subsequent human drama distract from the more ominous reality of what will happen when the oil money stops, and the community is still left without its industry and livelihood.